Over the last decade the intrepid team behind BBC Radio 3's World Routes has boldly gone to many impossibly obscure locations seeking out some of the globe's oldest folk music. 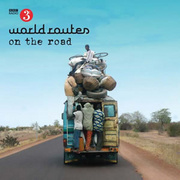 World Routes: On The Road selects some of the highlights from the travels of the show's producers, and sees well-known acts including Malian kora player Toumani Diabaté and Cape Verdean guitarist Tito Paris nestle alongside lesser known and rarely recorded artists, often based in remote locations. The geographical breadth of music covered comes from a staggering 53 countries, the World Routes team having visited 15 in Africa, 15 in Asia, and nine in the Americas, often in dazzling surroundings. Much of the material is played acoustically, in some cases dating back hundreds of years through generations, and the timeless sounds ooze a refined class. The whistle-stop tour of rare and unusual acoustic settings is a joy, from the hamman where Turkish saz master Cengiz Özkan recorded 'Elif Dedim be Dedim' to the inside of a volcano crater in Cape Verde where guitarist Michel “imprisoned" himself for his track 'Homi di Fora'. There is also room for spontaneous recording, like when microphones capture the Langa Children of Rajasthan in India playing in the street. While many of the artists were recorded in their most natural of environments the World Routes team also travelled to Jordan to record Iraqi singer Ilham Al Madfai, whose 'Baghdad' is a love song to memories of his beloved former home. Many remarkable stories about the origins of these tracks, often steeped in ancient tradition, are revealed in the extensive liner notes detailing the recording sessions and process of capturing the musicians at their best. On more than one occasion the producers took risks, like fearless war correspondents, negotiating some dangerous and tricky, and sometimes conflict-torn terrain in pursuit of their subjects, defying the Beeb's health and safety officers. But, if these rich pickings are anything to go by, it has been worthwhile. In one instance the crew was flown by helicopter provided by the Georgian Air Force to reach mass male voice choir Rohi in Georgia's Caucasus mountains, some of the highest inhabited land in Europe. The 20-plus strong group, uniform-clad in red woollen cloaks (complete with foot-long daggers) are backed by a lone eight-stringed harp, the changi, plucking medieval licks to the brooding and sinister deep voices, suitably foreboding as they relay ancient folk tales from this severe, unforgiving location. Familia Pilco's western theme-like funeral march that closes the set comes from another dizzying lung busting altitude, in the Peruvian Andes reflected in their unhurried but methodical playing. Temporarily discarding the track list and listening blindly it is easy to become disoriented as wildly different styles collide in harmony and meddle with your guesswork. One powerful voice soars from the speakers, backed by a jaunty violin and occultist percussion, spookily demonic and tinged with eastern promise, but where from? Brazil, as it turns out: Renata Rosa fronting a group playing the infectious “sea horse" style, which, in keeping with a surreal tradition of the carnival it celebrates has nothing to do with sea horses, and must be performed while sitting on a wooden bench. The compilation digs deep to unearth its sources, and you discover that these artists are too digging deep, sometimes literally, to create their sounds. For their recording of 'Waire Nzira Nte' (which translates as “Even If I Don't Have A Cow") the Nakibembe Village Musicians of Uganda dug a deep hole in the ground as an echo device to amplify the sounds of their huge 21-key pit-xylophone based on a foundation of banana stalks. This unique instrument provides a ringing thumb-piano like sound, as up to four players create polyrhythmic layers of interlocked melody and percussion styles, backed by a group of enthusiastic singers. Also from Uganda, the Watman Cultural Group are captured showcasing 'Lweny Dong Pe' in a Kampala hotel room - a riotous thumb piano jam, an acoustic alternative to traffic cacophony specialists (and Quietus faves) Konono No.1 from DR Congo. From the far east, Japanese sanshin (a three-string lute with python skin body) player Sadao China's 'Nakankari-Bushi' mantra paves the way for consciousness-expanding om and later, it is welcome relief to eventually spend a bit longer in one zone. 'Samaja Vara Gama,' a 10-minute plus South Indian classical raga by Aruna Sairam and Hari Vrndavn Sivanesan benefits from being given the breathing space to fully open out, inviting you to get lost in its ever-evolving cycles. A spiritual trip recorded in a shrine, Hari coaxes sublime modal drone on the veena as Aruna opens her throat to unleash soothing Pandit Pran Nath-like devotional meditations. Along with compilations reviving obscure and often long forgotten “golden ages", World Routes: On the Road opens out the roots for plenty more relatively untapped sources waiting to be heard over its two discs and 30 tracks. Some of the artists have more material widely available for further discovery, but for others there is very little or nothing, making the preservation of these recordings all the more special.